Every weekday morning, Tony Casson has climbed into a tiny trailer about the size of a dorm room and started warming up savory pies and hash browns that were baked the night before. The delicious aromas waft out from where he is stationed in front of Central Union Mission and tempt passersby on Massachusetts Avenue. Some customers eat or socialize at small tables, others take their morning coffee — also known as Mission Mud — and go on with their day. 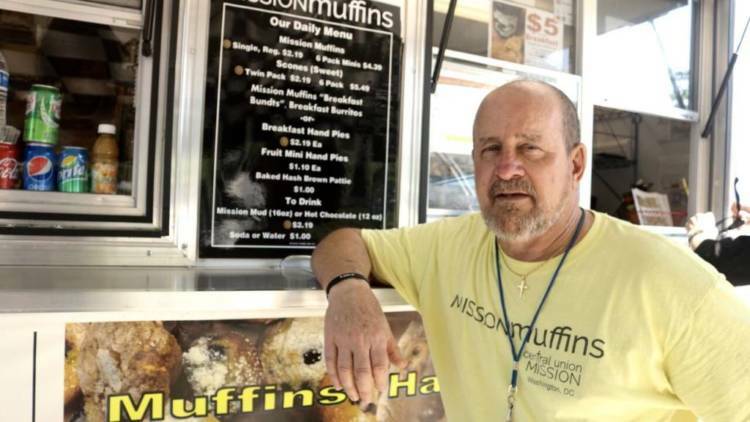 Thanks to a loan from a nonprofit, Casson was able to move his business, Mission Muffin, out of a tent. The nonprofit lender, Breadcoin, is allowing him to pay back the loan over time, based on how much food he serves to people in need. It was an easy choice for Casson, who has been passionate about helping people for years. Using businesses like his, leaders of Breadcoin said they aim to build a community around feeding hungry D.C. residents. Cary Umhau, one of the co-founders of Breadcoin, has volunteered at Central Union Mission for more than a decade. The faith-based nonprofit provides shelter and other services for the homeless community near Union Station. Umhau said it seems like more and more welfare and assistance programs are cut each year. These observations motivated her and co-founder Scott Borger to create a small metallic coin that can be exchanged for food. They wanted a more substantial way to help the people they were serving at the mission. Umhau said people tend to think of others as stereotypes rather than as complex human beings they can empathize with. So she and Borger started trying to imagine what it would look like to change how people see and care for each other. Users of the coins and the businesses who accept them both said the program has a ways to go before the whole city is on board. Each coin is worth $2.20 and costs $2.50 to purchase. People who buy the coins can give them out to people on the street, donate them to nonprofits, or allow Breadcoin to distribute them. Each coin can then be exchanged for food at any of Breadcoin’s six participating businesses, including Mission Muffin. Jerry Gill, who has worked at Mission Muffin for eight months and receives some of the coins the organization distributes, said he has given out more than 100 coins to people who are hanging around Central Union Mission. He said most of them know about the Breadcoin and he tries to give it to the people who really need it. “I know what it’s like to be homeless,” Gill said. Roy Stevenson, who lives at Central Union Mission, said he spends approximately one coin a month at Mission Muffin. He typically receives the coins from volunteers that work with Breadcoin. He and two other regular users didn’t know the coins \were accepted anywhere else. While the economics of Breadcoin are complicated to most people, Casson said anyone can understand the appeal of offering people tokens for food instead of money. Central Union Mission gives out cards with seven recommendations of how to help homeless people. One of the seven is to not give them money, according to Casson. Chance Gibbs, a manager of the Foggy Bottom Captain Cookie, which accepts Breadcoin, said no more than 20 coins come in to the store each month. Gibbs said he would usually give people who said they were hungry or thirsty a drink or a cookie, but the coins seem to empower people to come in. “We try our best in here to make it a community like that,” Gibbs said. When customers see Breadcoin users buying cookies with the coins, or the Breadcoin sticker on the cash register, they will sometimes ask what it is. But Gibbs said many customers are in and out too quickly to really start up a conversation. Ezeldin Ali Diab, a hot dog vendor who accepts Breadcoin, said the coin seemed like an obvious choice to accept because, Like Gibbs, he was already feeding hungry people. Now, he said his customers can help hungry people by giving out Breadcoing and not worrying their handouts might go toward the purchase of alcohol or drugs. The business representatives said they don’t see many coins come through, but do see customers asking about the Breadcoin stickers or the coins. Scott Stevenson runs a program in Portland, Oregon, which similarly connects people who are homeless or impoverished with tokens that can be exchanged for clothes, food and other necessities. The coins are most useful for food at the end of the month when monthly food assistance begins to run out, according to Stevenson. Umhau said she is in talks with around 10 more businesses and ultimately hopes to get more than 20 eateries in D.C. to accept Breadcoin as a kind of currency by the end of the year, in as many parts of the city as possible. “It’s not a hard sell,” Umhau said. Once people understand the concept of Breadcoin, especially if they sit down with potential users, they often choose to participate. Breadcoin hosts pie giveaways or walking tours monthly to raise awareness about how the coin works and how community members can help. Most importantly to Umhau, these social events are designed to help supporters understand and get to know the people they are helping. So far, the coins mostly get into circulation through giveaways or people purchasing the coins to donate to events with food. One donor contributed coins to a June picnic for the nonprofit Code 3 Association and invited Captain Cookie to cater the event with one of their food trucks. Umhau said the next big push for the organization is getting people to purchase memberships, where they can buy $25 worth of coins a month and keep them in their pockets or donate them to nonprofits. D.C. is the perfect place to get people to invest in Breadcoin because hunger in “the shadow of the Capital” stands out, according to Umhau. The challenge is connecting people in need to the people who can fill it. She hopes the transient portion of D.C.’s population, people who are only here for a few years for school or work, will take the idea behind Breadcoin with them.